I had a grand plan to share two new recipes with you early last week in addition to a new one after Thanksgiving to use up all of those leftovers and none of it ended up happening. I’m not sure what is going on with my head, but I’ve had on and off migraines for nearly a week straight. Usually I can chalk up a migraine to being dehydrated or stressed, but neither occurred to any degree last week that should have created that kind of issues. I had so many plans for the weekend; planning, making and blogging a ton of December recipes, sending out Christmas cards, decorating the tree and finally getting back into writing again. None of those happened. 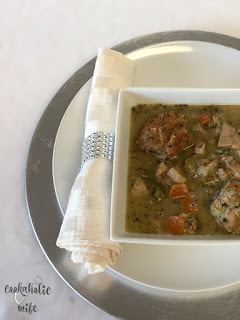 So by now you are more than likely sick of turkey and have either frozen or thrown out any leftovers you may have, but in case you have a little bit more holding out in the fridge, here is one more recipe for you that uses up not only left over turkey, but stuffing, veggies and stock. Turkey dumpling soup is a great way to use up leftovers from Thanksgiving, including turkey, stuffing and green beans. 1. Add butter and olive oil to a skillet over medium heat. Once the butter has melted, add the celery, carrots and onion and cook for 5-7 minutes or until softened. 2. Add the garlic and herbs and cook for 3 minutes more. 3. Transfer to a large pot and add stock, turkey, salt and pepper. Bring to a boil then allow to simmer for 20 minutes. 4. Meanwhile, make the dumplings by combining the stuffing with the egg and flour and forming into golf-ball sized balls. 5. Add to the soup and cook for 3-5 minutes, turning dumplings over once. 6. Divide soup into bowls and serve immediately. – Remove fresh herbs from soup before serving. If you do not have fresh herbs, reduce in half (minus bay leaves) and used dried. 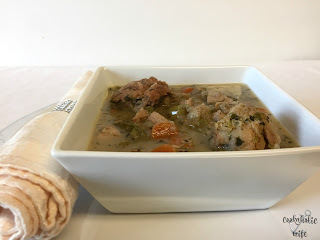 – If your stock is salted, do not add additional salt or pepper before the soup has simmered for 20 minutes and you’ve tasted it. – If your stuffing is very moist, you may not need to add flour or egg. If the stuffing holds into the ball shape on its own, add nothing. If it is too dry, add the egg. Too wet, add the flour. – Turkey may also be replaced with cooked chicken breast. – Leftover green beans and mushrooms from green bean casserole can also be diced and added to the soup; add in the last 10 minutes of simmering. Stuffing dumplings are delicious! They were my favorite part of this soup. I let a few cook down into the soup longer until they fell apart. 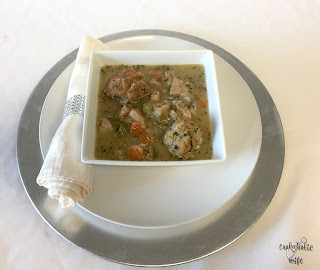 It thickened up the broth and added even more flavor into the soup. I’m actually kind of sad that I didn’t have more leftover ingredients to make a bigger portion of this soup.